Houzz 174 of our visitors have told a friend about this plan. Question: The loft upstairs looks like a sold wall. Is that closed off? Answer: Good morning, thank you for you interest in our design. The loft is closed off with a wall, but the balcony is open to below. Question: What is the sq ft of all the porches? Trying to figure out total sq. Question: Do you sell the plans for the garage separately? Client wants to build the garage first and the house later. Answer: Please see plan 82323. Question: What is the total depth of the house, from Master bed to Laundry? Question: What is the sq footage of this plan with the loft area on the second floor of the home but nothing above the garage? Answer: The heated/cooled space measures 2555 sq ft without the bonus above the garage. Question: Will you send an image of the basement floor plan? 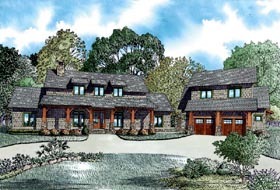 Question: Do you have a breezeway roof plan for this house to garage connection or is this a field decision? Question: Does the plan have handicap accessible door openings on the first floor? Question: I'm trying to determine if the wall that has the range can accommodate a 48" range. I see that there are cabinets on both sides of the range. If put a 48" range there, how much cabinet space would be left on both sides? Answer: Hello! If a 48” range was put in, it would leave about 1.5’ to the left and about 1’ to the right to the fridge. Question: Can you please send me the length of the kitchen island and the size of the range that fits this plan? Answer: Good morning, the length of the kitchen island is 9’, and the range shown is just a place holder, there is room on each side to accommodate the range chosen. The one shown is 2’7” but there is room to have a larger or smaller range of your choosing. Question: Before I purchase this plan I would like to see a more 3 dimensional layout. Can I get a PDF of the plans that give me a more clear picture of the interior? Answer: We can’t provide a PDF file before purchase. Question: Is there an attic access ( like pull down stairs) in the hall between bedroom 2 and 3 to access the space above. Same question for the area above the master bath. Answer: This is something that can be specified to your builder. Question: So if cieling heights are both 9 ft the top of the windows in the dormers are like 12 ft from the floor of the second floor? Is the timber frame truss ceiling vaulted so the cieling height in great room is 25 ft tall? Is the wall between loft and great room a full wall to cieling? Answer: The great room is open to the area above. The dormer in the loft is the only one that is not seen from the great room since this area is not open to below. Question: Why are there dormers For the windows on 2nd story of the house? Is the loft not a full 8 ft ceiling all the way to the wall? Or are the windows that tall? Answer: The 1st two dormers from the left allow additional light into the Great Room below. The 3rd dormer is located in the loft and allows for additional natural light. Yes, the main and upper ceiling heights are both 9 feet. Question: Do you have any interoir views of the home? Do you have any slightly modified versions including a powder room? Answer: At this time we do not have any interior photos of this home. Also, a powder room can be added as a modification, but we do not have a stock version of this plan that includes a powder room. Question: Is the covered area with the fireplace included in the square footage of the porch? Answer: Yes. Porch : 1408 Sq.Ft. Question: What is the max height of the garage? Is it different than the max height of the main home? Question: What does the two "IM" or "IW" abbreviations mean in the kitchen? One is in the island and the other next to the smaller refrigerator. Question: Is the great room area of the house timber frame? If not, are the six supports in plan structural? Answer: Good morning The ceiling beams are only a finish product and not structural. They can be omitted. Question: Is the outdoor living porch a screened-in porch? Answer: We don’t show on plans but it’s a piece of cake to screen it. Question: Would the plans be compatible with structurally insulated panel construction, or is that a whole different process. Answer: Hello and thanks so much for choosing our design! You can purchase the PDFS or CAD files and provide to your SIPs manufacturer. Another great building method: We can convert to ICF exterior walls; choice of wall thickness (concrete core is the variable). Question: Are the loft and guest loft included in the square footage of this plan? Answer: First floor and second floor included. The garage bonus is not included in square footage. Question: The dimensions for the kitchen does it include the dining area? Answer: Yes, dining is included in kitchen dimension. Question: Are there any pictures of the proposed interior of this house? Answer: There are no photos at the moment. Please continue to request photos as we will provide as they are available. Question: Is the great room ceiling vaulted or a two story ceiling? What are the dimensions of the two master closets? Thank you! Answer: Thanks so much for your interest in our design! The great room is a vaulted two story ceiling; 9 foot ceilings on main and upper.